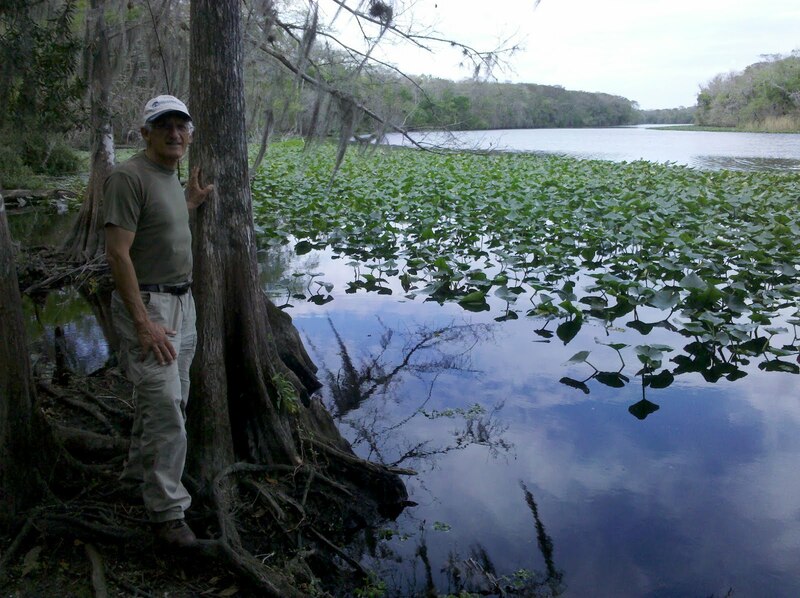 We’re back to civilization after a wonderful camping trip in the Ocala National Forest. 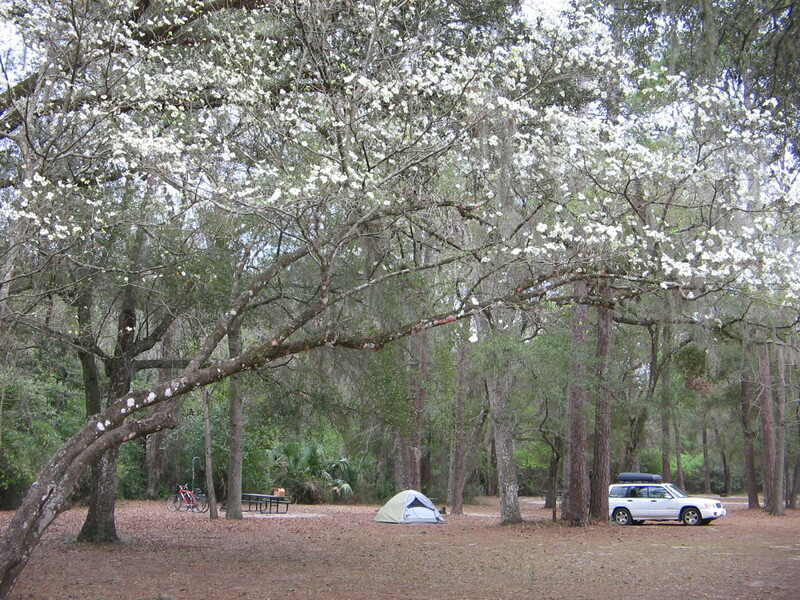 The campground where we stayed at Salt Springs was an interesting combination of two very different types of camping experience. We were in the “primitive” area for tent campers, which was only primitive in the sense that it didn’t have electrical hookups. The restrooms and hot showers and tent sites were some of the best we’ve seen. It was quiet and practically deserted. It turns out that almost all of the people staying there were at the other end in the area for RV’s. We were amazed at how full that area was, but it was so well separated from our area that we didn’t realize until the second day how full it was. The tent section was a short distance from the swimming area, which is a beautiful pool built around the spring. February is still too cold for me to think about swimming but, supposedly the water in the spring stays at a constant 72 degrees. It bubbles up from 7 large and 2 small vents in the limestone base. 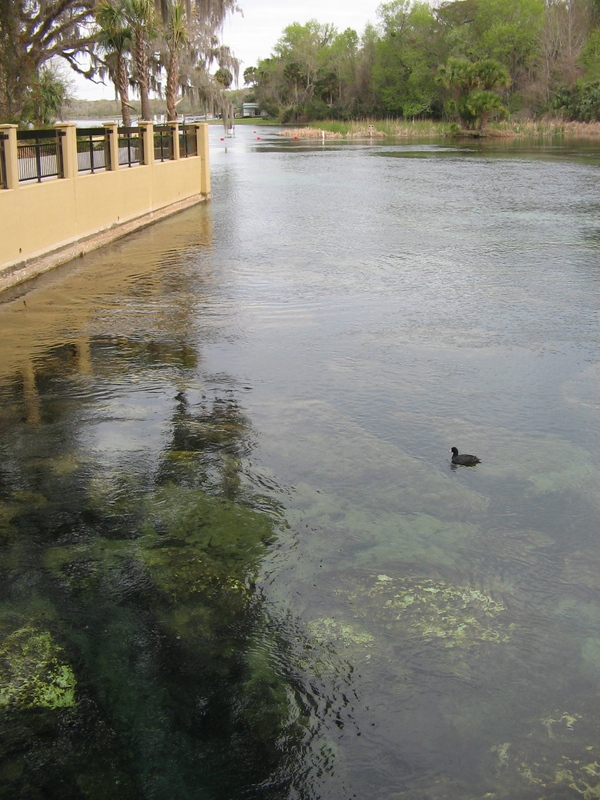 Most of the pool is only 2 feet deep with clear blue water where you can watch the many fish swimming around. The water is deeper over the vents; some of the vents are reported to be up to 20 feet deep. 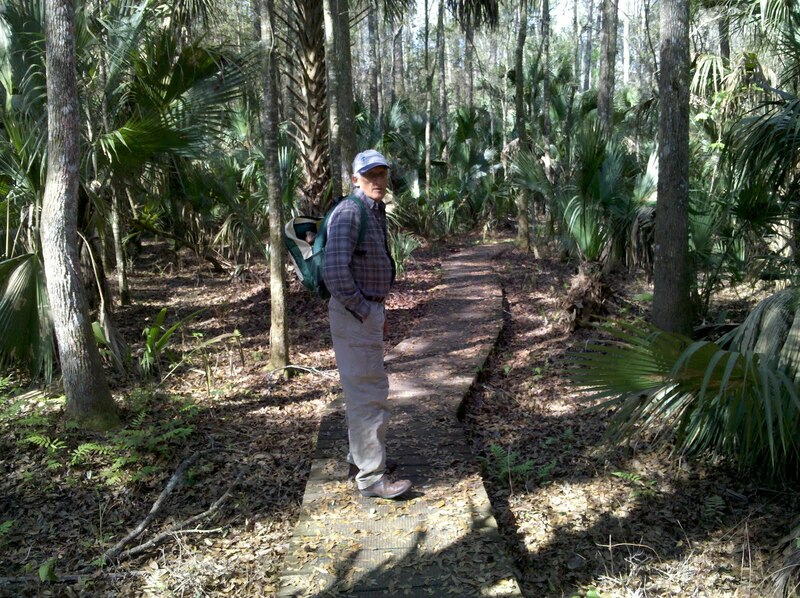 What we also liked about camping at Salt Springs was the easy accessibility to the many hiking trails within the National Forest. 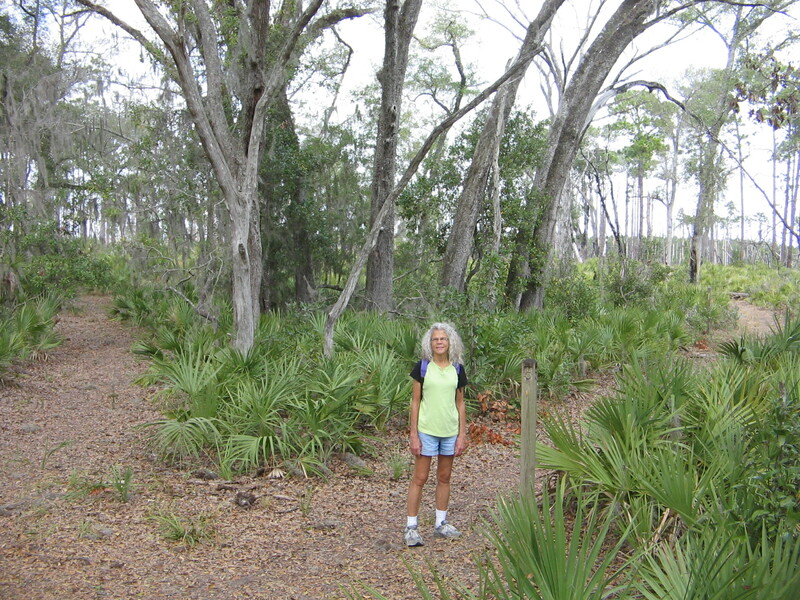 The Florida National Scenic Trail runs the length of the forest. Obviously, we couldn’t hike all of it in the short time we were there but we did do an out-and-back section of it one afternoon. We walked through pine scrub and oak hammocks and then the trail opened up to a view overlooking Hopkins Prairie, a massive wet prairie basin. 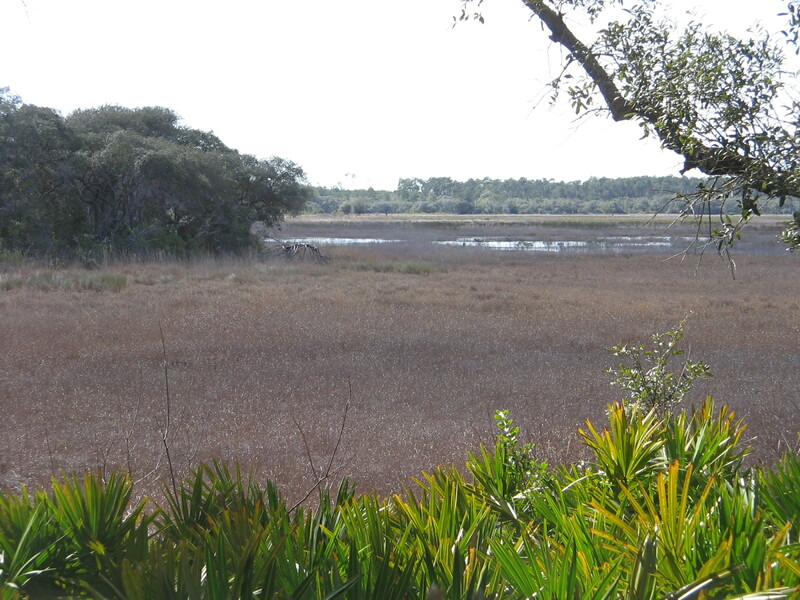 Of course, with the ongoing drought in Florida, a lot of it is now dried up. 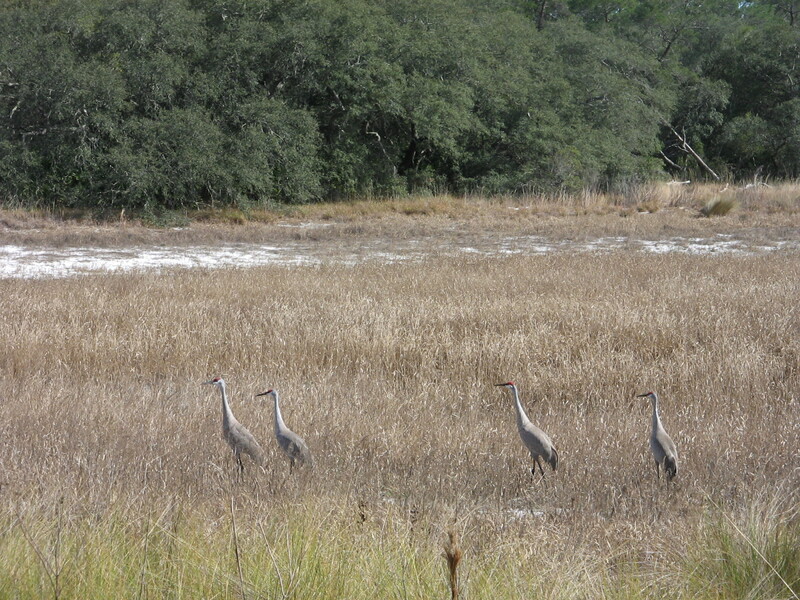 We did enjoy watching 2 pairs of sand hill crane making their way across the prairie. 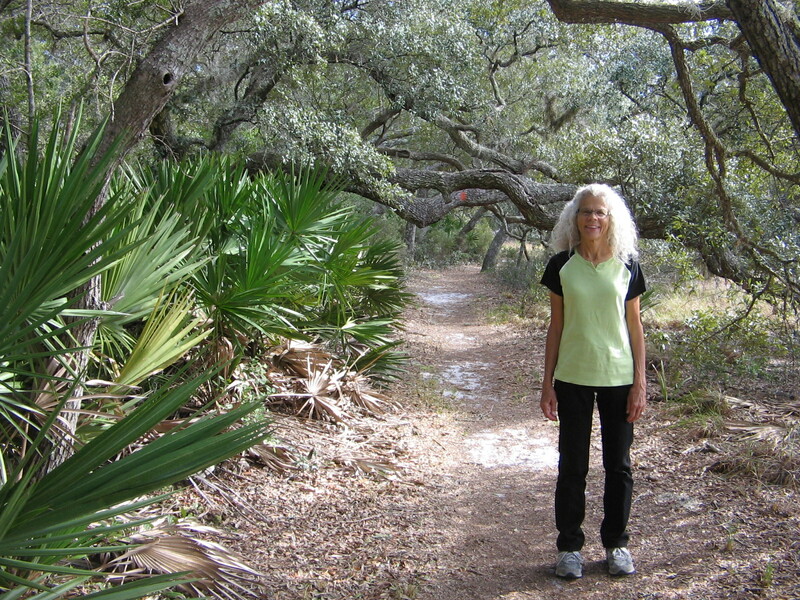 The St. Francis Trail that we hiked on the second day was a 7-mile circuit hike that led us down to the banks of the St. John’s River. In the 1880’s there was a town called St. Francis at this site, but we were a bit disappointed to find no evidence of a past settlement anywhere at the site, not even a signpost to indicate where it had been. On the way back we did cross an interesting bridge that went over an old levee. The levee had been built to flood an area for rice paddies in an unsuccessful venture to grow rice. 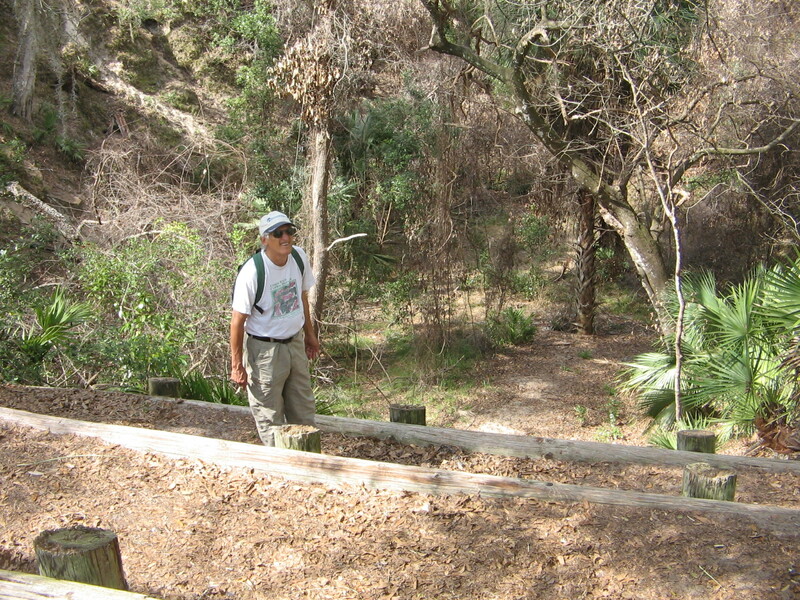 Today’s hike, on the Yearling Trail, was the most interesting from a historical perspective. It traverses an area called Pat’s Island, which is not an island in the usual sense. 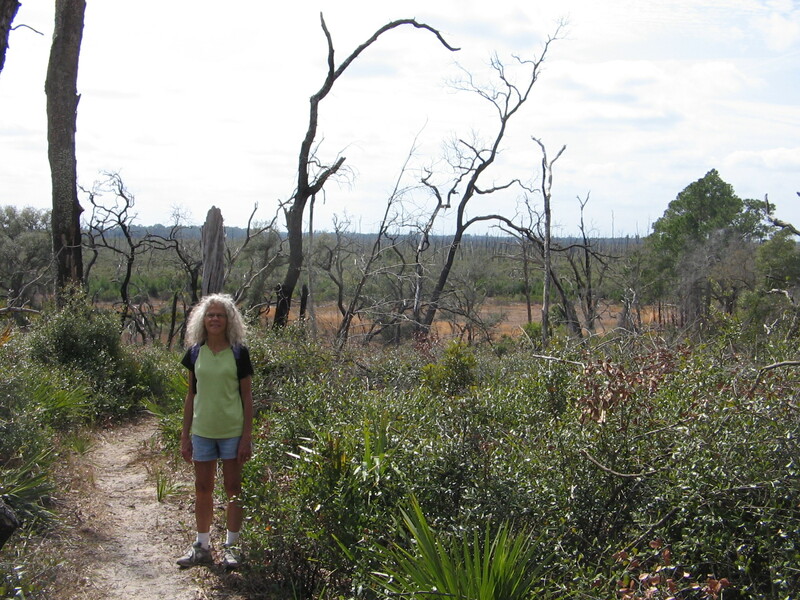 Settlers called these areas of wilderness islands because they were oases of fertile soil and moisture surrounded by a massive “sea” of pine scrub. 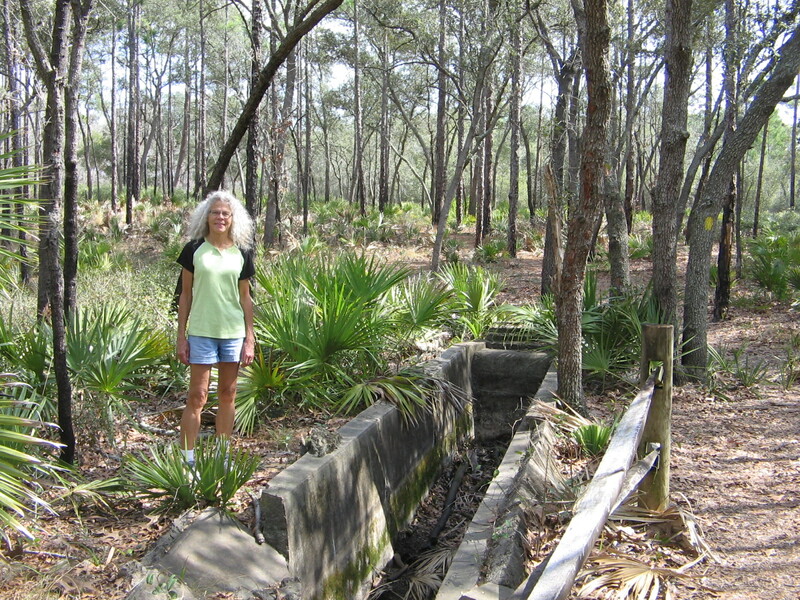 Pat’s Island was abandoned by its residents in 1935, after less than 100 years of human occupation. 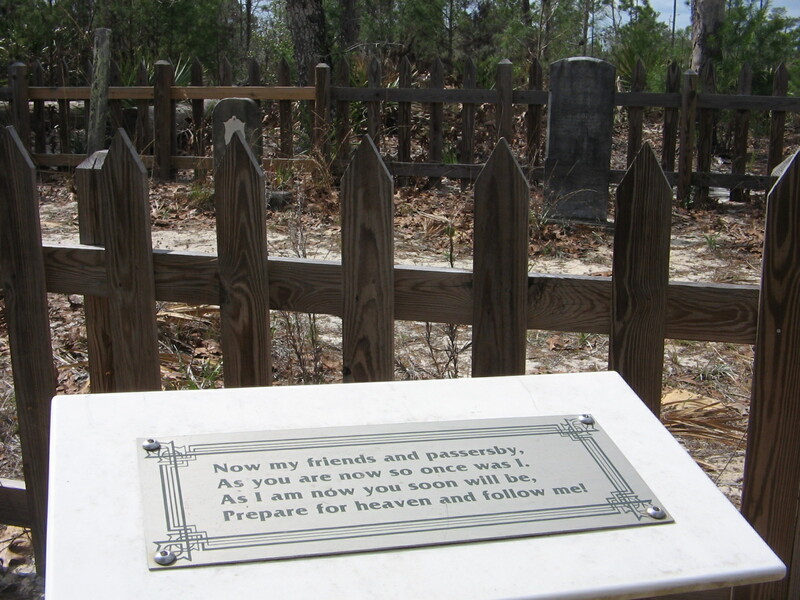 In 1933 the author Marjorie Kinnan Rawlings stayed with the last two inhabitants of the island, Calvin and Mary Long. Calvin’s childhood story of nursing a deer from a fawn inspired Rawlings to write her Pulitzer Prize winning novel, “The Yearling.” The novel was made into a movie starring Gregory Peck and Jane Wyman and filmed on location in the early 1940’s. 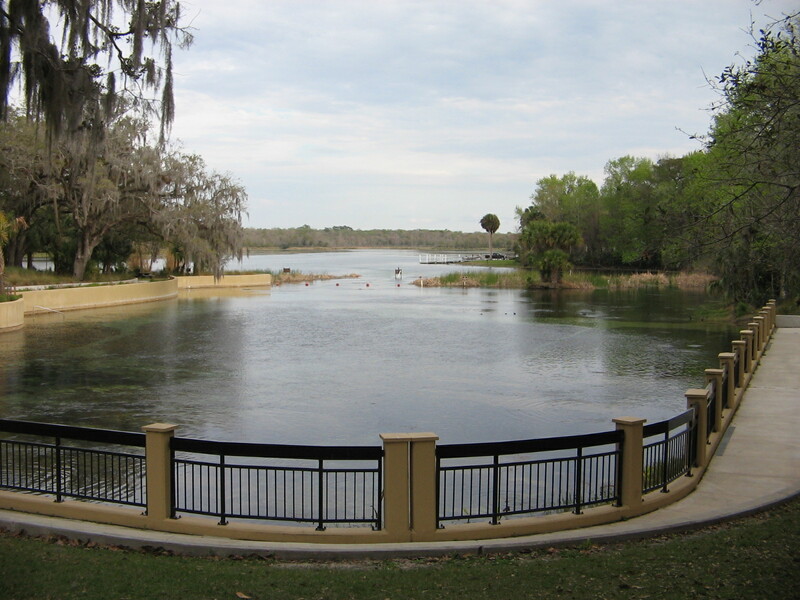 Residents of Pat’s Island used this sinkhole, which is now dry, as their source of water. Remains of a cattle dip site. Today’s hiking weather was some of the sunniest and pleasant we have had. 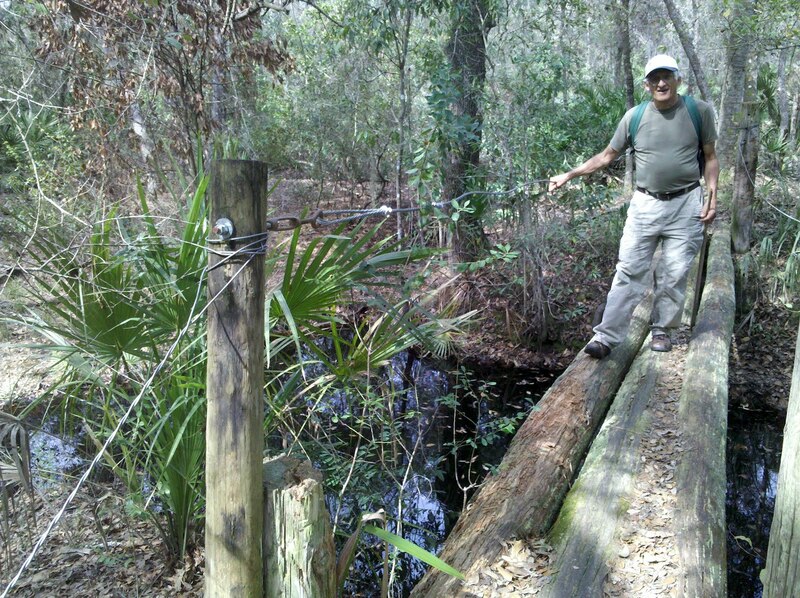 We were very tempted to spend another day camping but decided to continue on with our plans to leave Ocala National Forest. This evening we are thankful that we made that decision. The first significant amount of rain has showed up here in the form of some heavy thunderstorms. I may have complained about the continued cloudiness and threat of rain last week in Gainesville, but, in actuality there was hardly any rain there during that time. It’s good to see some rain finally getting here and especially good to be in a nice, dry motel room while it’s raining! It looks like a beautiful area.